When my world gets big and discombobulated, I often find myself in the moment of choice. I could choose to become escalated, loud. I could choose to rail against the multitude of things showing up, throwing myself on the floor in a fit of tears and terror about the enormity of it all. Or I could choose to settle into a state of quiet coexistence with all that is happening around me. I find myself by pulling out the cutting board. Readying my ingredients – going to the store and carefully perusing produce if I don’t have everything that I need. I find myself in the slow rough chop of garlic and brussels sprouts. I find myself in the careful and quiet process of creating something delicious out of seemingly disparate parts. This version of myself is the real me. The me that exists beneath the tendency towards melodrama, the loud exertions of my ego and bright spirit. The me that exists beneath my distinct ability to complicate matters, searching to reinvent the wheel at every turn. I find myself, instead, in the steady boil of an unwatched pot, sprinkled with salt. I come from women who cook. Women who share their love for one another through steaming, simple soups and silver dollar pancakes. Women who seek their own sustenance and nurturing in peeling the skin from the onion and a sense of order in the cutting it into tiny, similarly sized pieces. I find myself, again and again, with my feet in my slippers on the cold linoleum floor, making order of my internal landscape by following a recipe and feeding my spirit by intuitively tossing in spices at the end. Today, as you are moving about the world, find yourself in the moment of choice. Slow things down. Invest in yourself and the legend of your own happiness by turning your attention towards the things that light you up, that bring you home. Today, choose your rough chop, your steady boil. Today, choose to find yourself in the spaces between. Combine 1/2 cup of raw buckwheat groats and 1 cup of water in a large saucepan with a sprinkle of salt and bring to a boil. Reduce the heat to low, cover, and cook for 10 – 12 minutes. Truthfully, I chose these vegetables because they were what I had on hand. You can toss in any vegetables that you have! Rough chop your preferred vegetables into small, bite sized pieces. Mince one shallot and two cloves of garlic as small as you are able. Turn on your pan to a medium heat and melt a dollop of coconut oil in the pan. Add your vegetables, shallot, and garlic to the hot pan and sauté (cook) them until they are tender. Add your preferred amount of cooked groats to the pan of tender vegetables in a ratio that is pleasing to you. Trust yourself. You will not screw this up by having too many vegetables or too many groats. Go with what feels good to you. Stir the two together in a pan on low heat, combining them nicely together. Once they are combined, add a little olive oil and add either nutritional yeast or parmesan cheese. Again, to your liking. I love my risotto pretty cheesy but dairy free, so I opt to add in two tablespoons of nutritional yeast. 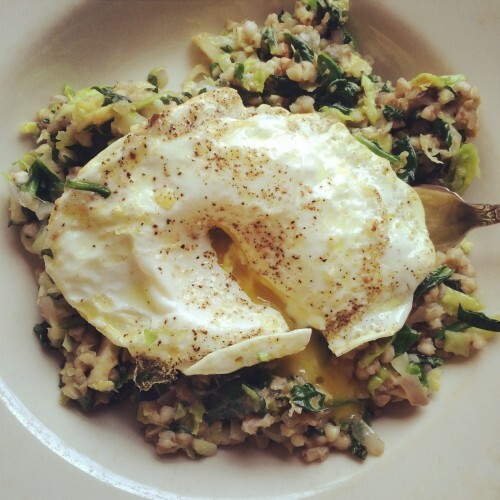 There is a lot of protein in buckwheat groats already, but sometimes I like to add a fried egg to the top of this dish or some sautéd shrimp. Serve in a pretty bowl. Enjoy!